Former job seeker Lalita and her supportive employer, Husna Pasha from Alisha’s Café Collective. Mature age job seeker Lalita Appiah came to MatchWorks with multiple barriers to employment. A chronic back issue had reduced the Melbourne job seekers quality of life and it was difficult to find suitable work. Lalita’s confidence had been significantly impacted after eighteen months unemployment and limited English skills created another barrier to her finding the right job. Once in touch with the MatchWorks Epping office, Lalita’s life started to turn around. MatchWorks Employment Consultant, Lisa Ruxton quickly identified the job seekers key strengths and discovered her love of cooking and learning. “Lalita has a cooperative nature and showed a great willingness to develop her skills and expand her knowledge,” Lisa said. These new skills gave the Melbourne job seeker the confidence to find a new part-time chef opportunity at Alisha’s Café Collective in the heart of Lygon Street, Brunswick East. 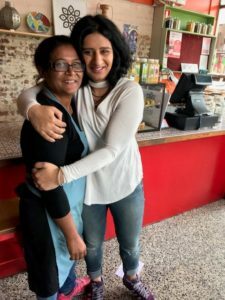 “Lalita has blossomed into her own since she started in the café eight months ago,” proud owner of Alisha’s Café Collective, Husna Pasha said. Like MatchWorks, Husna is on a mission to help create happier people. Alisha’s Café Collective is the author and media personality’s first foray into the world of food and Husna has worked tirelessly to establish a supportive and inclusive business that encourages shared cultural and community experiences. This inspiring work environment has enabled Lalita’s culinary skills to shine and the former job seeker has even designed the café’s signature dish, the Gateaux Piment (gato burger). Lalita continues to do her best at all times in spite of her ongoing health issues. She shared with us that finding meaningful work had given her a fresh outlook on life and a big boost to her self-esteem. What a fantastic outcome for all. MatchWorks has more than 150 sites across Australia. Call 1300 13 23 63 to find out how we can help you establish a new career.